Hello everyone welcomes to Aviation Dreamer. You can find Aviation Job and Aviation Interview Tips here. 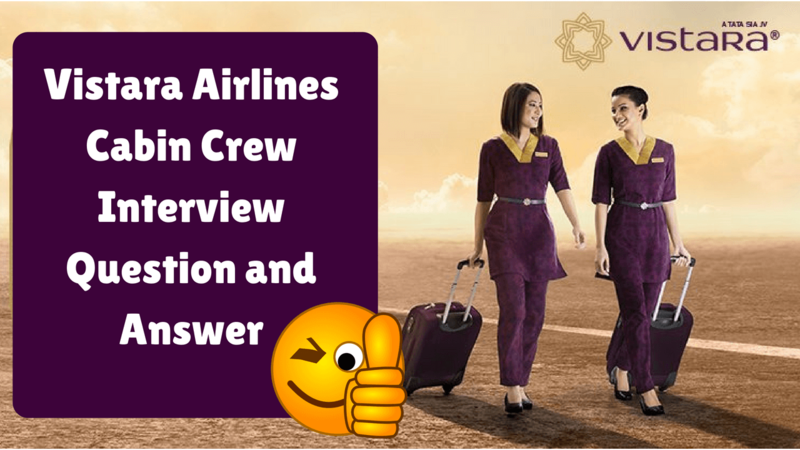 In today’s article, I will describe Vistara Airlines Cabin Crew Interview Question and Answer. So, if you are dreamed to make Vistara Airline Career as cabin crew, then you are in the correct place. Without skipping any words or any sentences read out the full for clear your cabin crew interview. The most common thing observed is the confidence and personality of an individual for a crew. They may ask you to go for an English language exam with grooming checks (height/weight and scars). Questions asked in personal life can be related to your current life scenario like plAce you live, family life or about your job if you working anywhere. They may ask you also about your knowledge related to cabin crew responsibility at work. Like I said they ain’t looking for content but the way you convey your content, the way you draft your personality as an individual among all. The patience you possess in group discussions with the bunch of people. The genuine smile you can glitter even in most stressful situations. Never consider it as a job of glamour or opportunity or mode for seeing the world, because it’s much more than the common man assumes about a job of cabin crew. The questions which are asked in an interview of airlines are basic and most common in all airlines. Tell me what you know about this airline? Where do you see yourself in coming years? What are the duties of a cabin crew? Do you like to work alone or on the team? For Strength – You should say about those things in which you are really very good. For example, if someone is good at leading a team then he/she should mention about his/her leadership skills. If someone is so punctual then he/she should mention his/her punctuality. For weakness – 1. Sometimes I give importance to useless opinions and start analyzing my decisions. Also, Sometimes without thinking about myself work and work. For answering this question you can take help of Google.com or Wikipedia. And know about Vistara Airlines Cabin Crew. You will answer this question yourself – like after a long time where do you want to see yourself? or what is your goal? Air cabin crew members provide excellent customer service to passengers while ensuring their comfort and safety throughout the flight. The crew is trained to deal with security and emergency situations which may arise and can administer first aid to passengers. When you will attend a walk-in interview of Vistara Airlines Cabin Crew answer will depend on the interview that for which position do you apply?. so, we can see cabin crew are working together or on a team so your answer will be base on teamwork. Allows you should try to understand the interviewer that what and why they are asking this question to you. Then answer each and every question answer.